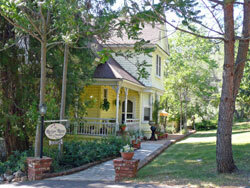 An award-winning country inn offering victorian hospitality and comfort. Overlooking picturesque Columbia State Historic Park, in the heart of the gold country. This handsome Columbia victorian began receiving guests in early 1992 after a complete renovation by owner Samantha O'Brien. The two-story gem, considered one of Columbia's finest homes at the turn of the century, sits on a hill across from the town's 1860's vintage school house. Victorian and American antiques appoint three spacious upstairs bedrooms. Each room has a unique view of the Harlan House grounds... lush green lawns, flower gardens, shaded patios and porches. Columbia's historic vista looms up to the southwest, a short stroll away. Harlan House's unique wine cellar suite offers a private entrance into a luxurious parlor. A bedroom with a queen-sized bed, a sleeping nook with a double bed, and a large bathroom with spa make this the coziest getaway in the region. . . . All rates include lodging and full breakfast for two. 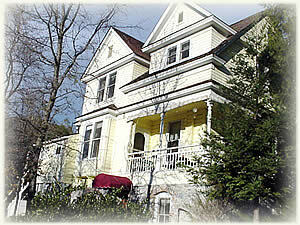 The Harlan House is an adult bed and breakfast.